How a 24 Hour Alarm Can Prevent Overnight Intruders | Calgary Alarm Inc.
A home alarm system should protect you, your family and your home from all possible emergencies, from fire to intruders and everything in between. As a homeowner, home invasion is a frightening possibility, especially for those who live with children, the less physically abled, and those who keep valuable possessions in their home. 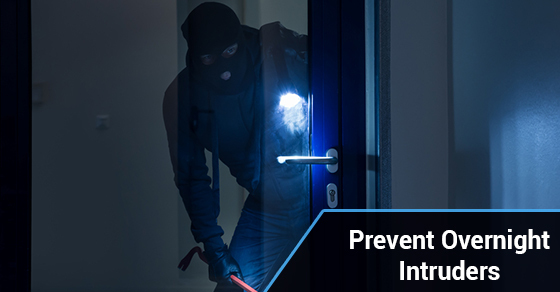 Burglaries or break-ins that occur while nobody’s home are frightening enough, but the idea that someone could break into your home at night when people are home is even worse. The best way to avoid home intrusion is by having a 24 hour alarm system professionally installed. Two-Way Voice Response: Once the alarm is triggered, whoever is in the home will be able to listen to and communicate with the emergency dispatcher. This is especially ideal for homes with children, or for residents who are differently abled and may find it difficult to reach a telephone in case of an emergency. Smart Home Monitoring, 24/7: With 24/7 smart home monitoring you can control everything from your thermostat to your lights, and monitor your home remotely using a tablet, smartphone or computer from wherever you are. Interactive Video Surveillance: Real time video surveillance allows you to remotely view video streams in real time. Guard Response: Uniformed guards may be dispatched once an alarm is triggered, before emergency services arrive, in order to avoid false alarms and increase safety. A 24 hour alarm will ensure that whether you are at home or away, you will know immediately once an alarm is triggered. This can work with other features such as two-way voice response, or guard response, so that you get the emergency response you need as soon as possible, dramatically increasing the safety of you and your loved ones. Calgary Alarm is the most trusted name in security. Contact us today to discuss which security package is the best for your home and your family. Having a professionally installed, 24/7 alarm system is the best way to keep you and your family, as well as your valuable possessions, safe and sound!